Writing, Surviving & Thriving: Juicy! But I'm back to juicing on a regular basis. Jiggy likes to juice, too. My mother got me into it. I frowned at the glass the first time I saw it, but now I love it. There are a million ways to juice. I usually follow this recipe: a bowl of some type of green veggie (spinach or kale), a sweet piece of fruit or two, and a half a lemon. Lemon is key. It makes it sweet but tart. Don't peel anything. You may have to slice your fruit & veggies in half, but that's it. This will usually make about a glass. Juicing ain't cheap! Our ingredients this morning. 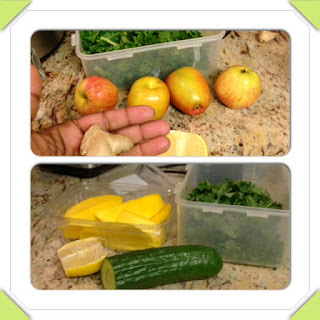 For hubby: apple, lemon, ginger, & kale. For me: cucumber, kale, lemon, & mango. You may need more fruit depending on how you want it to taste. I don't like my juice too sweet, so I usually just use 1 pear or sweet apple (like a fuji). Carrots also juice really nicely. I use them when I need more sweetness sometimes. I've also tried beets and like them. As of late, I've become a huge fan of pineapple and cucumber. Both juice nicely because they're watery. We have some watermelon in the fridge, and that will go in one of our juices this week. Sometimes people skip the veggies altogether and just make fresh fruit juice. Not me, I live for the green veggies in mine. This is a great way to get your nutrients. Instead of having to eat a bowl of lettuce or spinach, you can extract all the nutrients and drink them in a glass. People suggest that you drink the juice as soon as its done to get the most benefit, but I know people who juice enough for a pitcher and drink it over a few days. When I juice, I can usually skip coffee. I'll usually do juice and a light breakfast. Some people treat the juice as their breakfast. I can sometimes, but I usually still eat something solid like toast and/or an egg. Folks are always so shocked at how good juice tastes. I convinced one of my girls to try it, and now she's hooked. She'll usually post her juice of the day on her Facebook page, and it is followed with lots of comments to the tune of "YUCK!" and "Gross!!!" It may not be for everyone, but trust me, if I can get my husband, the ultimate meat & potatoes man to check it out and LIKE it, it can't be that bad. When we get off track with our nutrition, he's now reminding me that we need to get back to juicing. 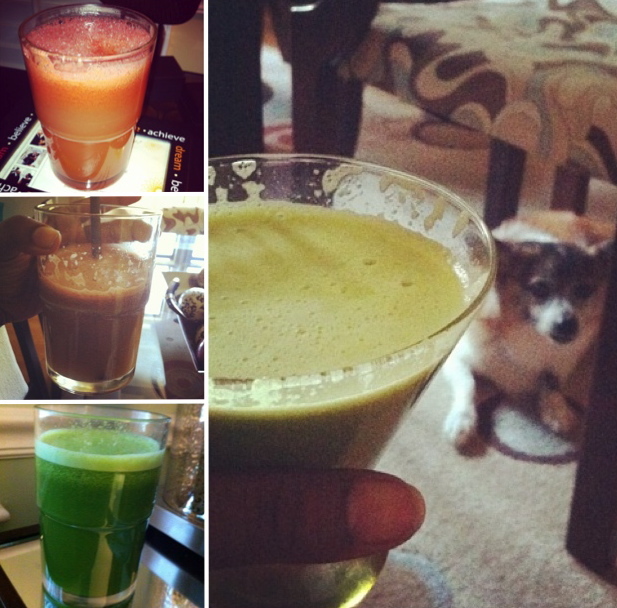 Hubby's first juicing experience last summer; now he's hooked, too! Couple of downsides to juicing. (1) It's messy. I recommend immediate clean up because you don't want your juicer to get any mold. Also, using a plastic bag in container for the pulp helps a ton. (2) As mentioned earlier, it can get expensive. I try to buy in bulk at places like Costco sometimes, and we also try not to go overboard when we shop for fruit and veggies. Don't get caught up and end up with a refrigerator full of stuff that you can't juice before it spoils. As for the pulp left over, I know some people bake with it. Depending on what I've juiced, I'll throw the pulp in a blender with a banana and some milk for a green smoothie (which I also love). Sometimes I'll add a little bit to Jiggy's dog food, but only when I don't use lemon. They're too tart for his taste. Here's today's morning cocktail. Yeah, that's a martini glass. I'm fancy like that. My favorite little photo bomber came down to toast with me this morning. Hope you have an awesome day! I'm off to be productive. Any fellow juicers out there? Be sure to pass along some recipes!